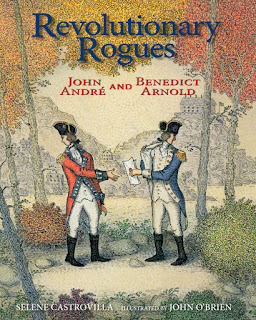 Selene Castrovilla is the author of the new children's picture book Revolutionary Rogues: John André and Benedict Arnold. 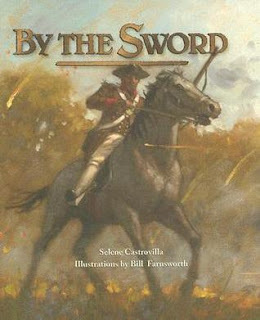 Her other books include Revolutionary Friends and By the Sword. She lives on Long Island. Q: How did you come up with the idea for this picture book about John André and Benedict Arnold? A: I really disliked history when I was in school. I found it boring—the dates, the battles, you never learned about people’s names. It was cardboardy. In my 20s I learned about a spy ring George Washington had on Long Island. I grew up here, and had no idea we [in this area] were involved in the American Revolution. It started me on this whole thing about the Revolution. We don’t live then but our passions never change. Benedict Arnold is fascinating. He’s our greatest general who became our worst traitor. How could someone go from one extreme to the other? George Washington loved him like a son. I go with emotions—why do people do the things they do? André became fascinating to me—I had never heard of him until I started doing research. He was the toast of the town in New York. How did he end up hanged in Tappan, New York? He turned out to be the more fascinating of the two. Even though he was British, Americans fell in love with him. A: I live not far from Tappan. I started reading things on Google, you can get into the Library of Congress on line. You can get primary sources. I read some secondary sources; you can look at their bibliographies [for more information]. I went to the Tappan Old 76 House where Andre was held. I went to West Point. You get the mood of it. The 76 House was so similar to what it was then; it’s amazing. The heart of the research lies in the primary sources. Luckily they wrote a lot. You have to read everybody’s side. Q: What especially surprised you? A: I learned how amazing John André was. He never should have been there. He was appointed to be a spy for no good reason. I was stunned that this amazing person would come to a horrible ending. A: I hope they realize that just because these people lived a long time ago they are not too different from us. You can take away the passions they had—freedom, love--they were just as valid then. We’re the same, just technology separates us. And empathy. Just because he was British, on the other side, he didn’t have to die. War does horrible things. Q: What do you think John O’Brien’s illustrations add to the book? A: It's a striking contrast from my text, and it adds a whole new layer of perspective to the book. It first appears whimsical, but the psychology of the art sneaks up on you, and suddenly your heart's in your throat. I also love how he created theatrical scenes, complete with curtains. There's so much to consider in these illustrations! A: These stories take forever. I have to fact-check them. The hardest thing about writing about history is what to leave out, especially in picture books. I’m working on a story about George Washington—Washington was the center of everything, even if he’s not the main character. After the Battle of Yorktown, the time before the peace treaty was signed, they were in the Newburgh area, having a hard time. The soldiers were starving, the officers were getting fed but it was a hard time for them because they hadn’t been paid and they were terrified because the war was going to end and they [worried they would never be] paid. A: I want people to know Benedict Arnold—people are either going to go crazy for him or against him. I like the idea of the book not going either way but letting the reader decide. My opinion was he was a real sociopath, but my opinion is not in there! On my first [school] visit I was with fifth graders, before the book came out. 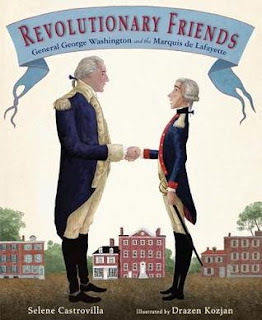 I showed it to the kids, and a kid said, I’m glad Benedict Arnold got away. And that was fine! I’m not enforcing anything. History is a cool thing—we can take our own lessons. It’s not for me to tell them.